US actor and director Al Pacino is to receive the Glory to the Film-maker award at this year's Venice Film Festival, organisers have announced. The prize is given to a film-maker who has left an "original mark" on contemporary cinema. The star of the Godfather trilogy joins such previous winners as Sylvester Stallone and Japan's Takeshi Kitano. 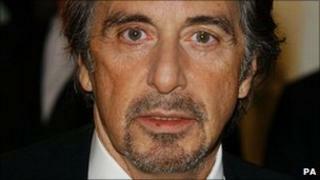 Pacino, 71, will receive the award on 4 September, ahead of the premiere of his new film Wilde Salome at the festival. The documentary, which explores the Oscar Wilde play Salome, marks Pacino's third stint behind the camera. The Oscar-winning actor, who describes the film as his "most personal project ever", also plays the role of Herod in the feature. Earlier this week he received a Tony nomination for his role in a Broadway production of Shakespeare's The Merchant of Venice. Festival director Marco Mueller called Pacino "an amazing director whose experience is precious and original and enriches the world of contemporary film". The Venice Film Festival begins on 31 August and runs until 10 September.